The Victorian election is the latest instalment of a five-year trend that has seen the Liberal Party lose ground in every state and federal election. What’s going on? The Victorian election has caught Australia’s political watchers off-guard. Even some of Labor’s candidates who have just won or become competitive in ‘unwinnable’ seats seem to have been caught by surprise. If they are true to form, the Liberal Party will blame its campaign strategy, and the Victorian branch will surely be sheeting some responsibility to their federal colleagues for the Dutton-Morrison-Turnbull conflict and Morrison’s inept interventions in the Wentworth by-election. Anything other than a re-examination of the Party’s policies. Federal Labor will probably spend the next few months cautiously presenting themselves as the real “grown-ups” in the political landscape, doing nothing to scare the horses. The Greens will be left wondering why, when their German counterparts have just won 17 per cent of the vote in conservative Bavaria, their Melbourne aspirations were smashed (hint – it may have something to do with candidate selection). And the National Party will probably carry on like ageing stud bulls who don’t realise that their lives of bucolic bliss will soon come to an end in most unpleasant circumstances. Independents’ gains in terms of seats are modest so far, but several National seats are under threat. I’m no political scientist, but I do have an addiction to numbers (it’s in an engineer’s DNA). For the last couple of years I’ve been looking at the primary swings in state and federal elections. (I haven’t included by-elections which have a somewhat separate dynamic.) 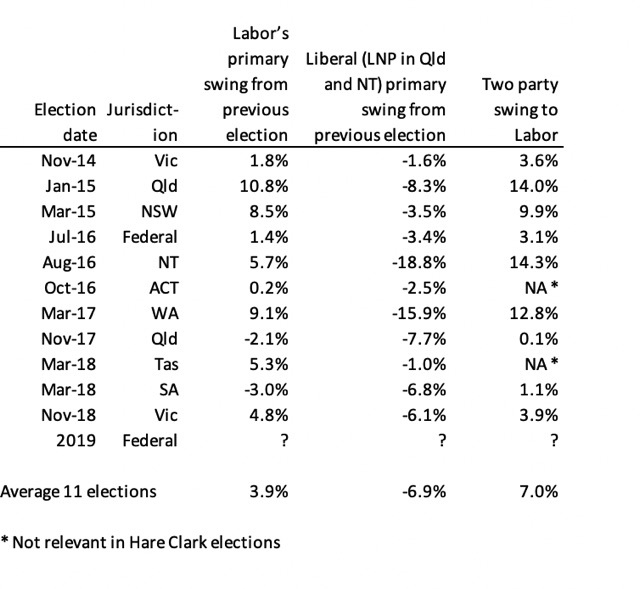 Readers of Pearls and Irritations will have seen this table before: the Victorian election has allowed me to add another row. These Victorian figures are preliminary: counting of postal votes could move them around a little, but the message is clear. On the primary vote, in every one of the last eleven elections the Liberal Party has lost ground. Not all the benefit has gone to Labor, and in some elections Labor has lost primary vote. Even Victoria’s election was more a Liberal loss than a Labor win. Some readers may be surprised by the South Australia election figures: wasn’t that the election that tipped Labor out of office? It was, but that was largely due to a re-drawing of electoral boundaries, which, in the previous election, had tended to concentrate the Liberal vote, giving Labor an unfair advantage. The Liberals lost votes to the Xenophon group, and after preferences finished up a little behind Labor in the two-party count. I leave it to others to interpret the meaning behind these figures. No doubt there will be a great deal of media attention to the most recent events – the Federal Liberal Party conflicts, the Wentworth by-election and the Victorian election. But what lies behind this five-year trend? Interpretations, opinions – even speculations – welcome. Ian McAuley is a retired lecturer in public sector finance, University of Canberra, and a Fellow of the Centre for Policy Development. Behind disillusion of the electorate with politics: the professionalisation of politics. Trend against the Libs: Australians like the centrist/centre-left policies of health and education. There simply isn’t the kind of support for right-wing free enterprise that their is in the US. Have nots and the haves (w/ banksters, organized religion, no needs based but beliefs based funding for education (what specially anointed schools really need is a third swimming pool, one for when it is cold, one for when it is hot, and one for when they don’t feel like swimming at all))? Washminster-style repressive democracy means the system is not delivering for the 99% as much as the 1%. It needs to focus on advancing Australia, fair. So let’s see what happens in terms of more direct democracy (or populism) in the near term, say a federal ICAC, campaign finance reform (you either get paid by taxpayers or lobbyists, but not both, Chinese walls between pollyTIC and party, really? ), useful FoI, mandatory and binding referendums for anything sizeable not part of a published election program. More broadly, much of Anglosaxony appears to be heading in the wrong direction based on the UN’s inequality-adjusted Human Development Index. Highlights come from across the ditch (in the latest 13th), Canada (in the latest 12th) and Australia (in the latest 7th). How about focus more on learning from Scandinavia/ Northwestern Europe instead of America (in the latest 25th, despite going for a populist instead of vested interests) or the quaint islands off the coast of Europe (‘Britain’ in the latest 18th)? Beyond the day to day media spin cycle focus, as in money, pollyTICs, …, China and OBOR for example, Russia’s push for territory, innovation out of India, South East Asia? Oh and signal the change, remove the colonial Union Jack from the flag! Keep the royals though, unlike some pollyTIC they have no need to raid the taxpayers.